Is in essence a one-woman comedy act but it is so much more than just an hour of stand-up. It is a very funny comedy show using multi-media presentation but rather than just presenting the audience with an hour of meaningless jokes or observations, Emmy takes us on a journey of discovery which is powerful, insightful and relevant. Live your best life is not group therapy nor is it just self-evaluation but elements of both are employed to deliver a very original and engaging show which will make you laugh throughout whilst leaving you pondering some of the thoughts or issues raised for a long time afterwards. The show starts with a startlingly honest statement of where Emmy is at today, with a difficult year behind her and certain aspirations and issues still being worked out or unrealised. This is handled with an easy, funny style which avoids any possible suggestion of self-pity or plea for sympathy. Rather, it provides an ideal platform from which to explore what really is the â€˜best lifeâ€™ and how can we find it, if at all. Having put her own cards on the table, Emmy invites us, in a very unthreatening way, to look at our own hand as she takes us through various ways we both try to find and are possibly manipulated to thinking weâ€™re living â€˜the best lifeâ€™. Comedy is found in every corner along the way and frequent surprises are thrown in for good measure. Emmy Fyles is a time-served actor-singer but remarkably, considering the self-assured confidence displayed throughout the show, this is her first venture into stand-up comedy and in so doing, has gone far beyond just standing up and being funny. This is a show which takes a side-ways look at many things and comparisons can be drawn with the likes of Bill Bailey and Dave Allen, both of whom clearly thought very seriously about life whilst looking for elements of humour and satire within it. In a TV format Live your best life could work well with breaks of quick sketches or perhaps on the 6.30pm Radio 4 comedy slot with the odd comedy song but the show at Gullivers was certainly complete in itself, requiring no additions. A very refreshing aspect of Live your best life is that there are no rants or vicious attacks on anything or anyone in this show. It completely free of any political biases and the overall feel is satisfying and uplifting. It will be very hard for anyone not to take away something from this show and which brave and bold in the way it challenges personal issues. It is also high relevant in a time when young people in particular seem to be under great pressures to succeed whilst just surviving for many is a real challenge with mental illnesses very much a matter of national concern. 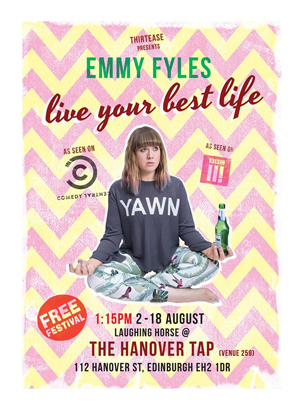 Emmy Fyles is a talent to look out for and Live your best life is a truly excellent show, both as a comedy act and serious food for thought. Live your best life is on at the Hannover Tap (Venue 259) in the Edinburgh Festival Fringe from the 2nd to the 18th of August.